This commentary originally appeared in the Providence Journal. However, we would suggest that the biggest source of discontent — and a very justifiable one — can be seen in one stark chart from the recent Brookings Institution / Battelle-TEConomy Partners / Monitor Deloitte report proposing a new economic strategy for the state. Here, what we would say is the most fundamental source of Rhode Islanders’ frustration absolutely jumps out. Over the last 25 years, only one state, Vermont, has suffered a larger proportional loss of what we call its “advanced industry” base. Advanced industries as defined by Brookings are a group of 50 high-value industries that conduct large amounts of research and development and employ a disproportionate share of STEM (science, technology, engineering and mathematics) workers. Ranging in Rhode Island from shipbuilding and jewelry manufacturing to biotech, computer design services, and corporate management, these industries are a central determinant of regional prosperity. States and regions that possess these industries in large concentrations benefit from vibrant industry clusters, well-paying jobs at all education levels, and the radiating economic benefits of their long supply-chains. States and regions that lose them are in for a world of hurt. And that is what has happened to Rhode Island. 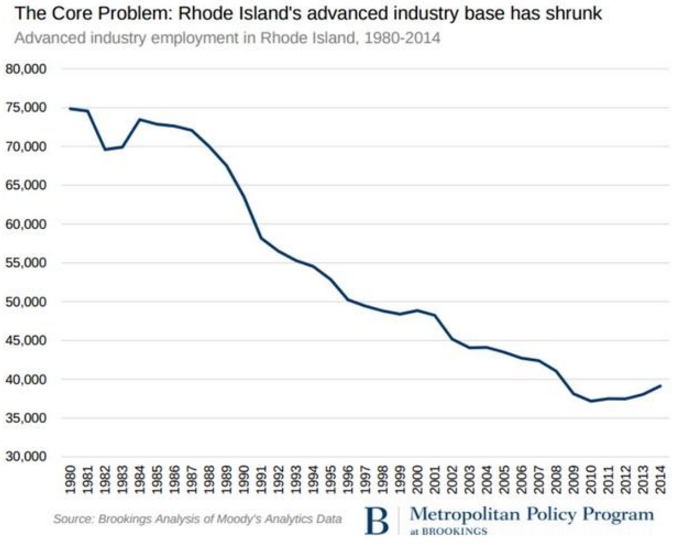 Rhode Island’s advanced industry base has been eroded disastrously since 1980. Rhode Island’s advanced sector dwindled from 18 percent of the state’s employment (75,000 positions) in 1980 to just 8 percent of employment (38,000 position) in 2013. Factoring in jobs indirectly supported by the primary jobs, the state lost fully half of its critical advanced industry-supported job base, as direct and indirect employment slumped from 135,500 jobs in 1980 to 68,600 jobs in 2013. Driving the decline have been catastrophic losses of manufacturing jobs, which accelerated in the last decade as the state’s labor-intensive specializations in toys, costume jewelry, and textiles proved disastrously susceptible to Chinese imports. All of which goes a long way, we believe, to explaining why Rhode Islanders remain irritable this winter even as the economic data continues to improve. Frustration and impatience are, in fact, rational responses to the 25-year erosion of the state’s basic growth machine and source of middle-class jobs. With the state having lost so much of its advanced industry base, Rhode Island workers and entrepreneurs have lost their best opportunities, their best sources for advancement, their best sources of good paychecks. The state’s horizons have contracted. The question is going to be: Can the state overcome its understandable pessimism in order to come together to act?